In the summer of 2015 Magners tasked us with creating an interactive exhibit for their sponsorship of Glasgow Summer Nights festival. The initial brief was pretty wide open, and the idea we settled upon was to create a large acoustic guitar sculpture out of Magners cans. 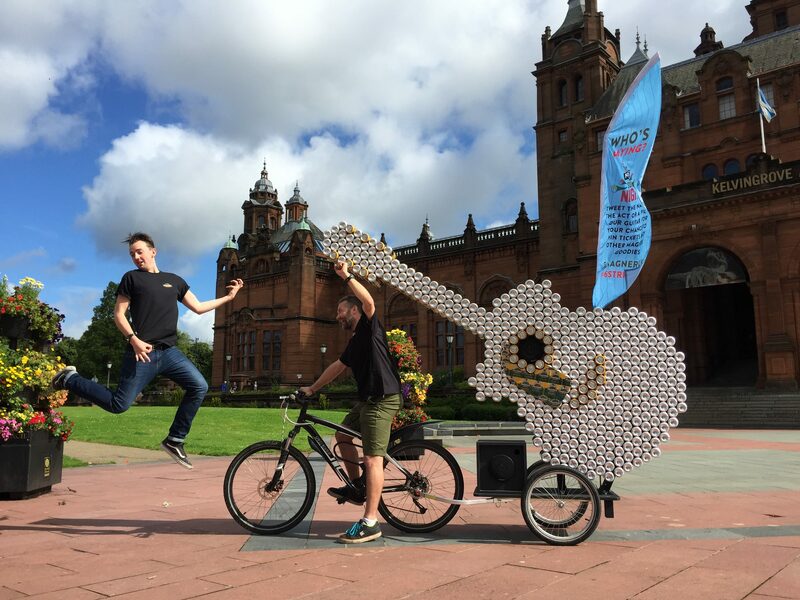 Working with a local sculptor, we sketched out a wheeled machine made from over 800 cans that could be towed behind a bicycle to promote the festival. For the digital element, we designed and developed an interactive Twitter jukebox. It had two modes of operation. First, users could tweet the name of any band/artist playing at the festival and the guitar would play their songs. Second, we created a competitive element — songs would play at random and users would be invited to name the band. Correct guesses won prizes on the spot. At the heart of the guitar we built a bespoke mobile sound system. High-powered car speakers went in the centre of the acoustic guitar with power coming from a small, rugged 12V battery which gave over 12 hours run time at the events. The battery was easily recharged overnight for use the next day. The whole system was controlled by a Raspberry Pi, using a 4G router as its gateway to the Twitter API. For power and bandwidth efficiency, all of the audio was cached locally within the guitar. The picture opposite is Grant in the back of a Transit van with the guitar, configuring the Raspberry Pi for the first time. One of the trickiest parts of the project was sourcing the cans. To keep the overall weight reasonable the cans had to be empty, but sourcing empty cans proved difficult. On the canning line, cans are filled before the lids are added. Due to the way the line works, it’s not possible to fit the lids to an empty can, so there’s no way to get a closed-but-empty can. Since most of the cans were to be mounted bottom-side out, that wasn’t a big issue — we simply used cans without a lid. But around 40 of the cans were to be mounted ring-pull-side out, which meant using full cans. Here our solution was to make small holes in the can base and drain the liquid out that way. It was a messy job, but our Gary donned his oil skins and got to work! The completed sculpture got a lot of local press coverage, before going out on tour for a month across Glasgow and Edinburgh where it was a huge talking point and photo opportunity for tourists. Despite highly variable 4G connections, the jukebox remained totally reliable throughout its tour. Following the event, the guitar returned to our office at Bright Signals where it occasionally takes on the duty of being our office party jukebox.